No chance for the Dialer rip off! Protect your PC with Emsisoft Anti-Dialer from manipulated dial up connections, which can cause a phone bill of several hundred dollars quickly.Emsisoft Anti-Dialer provides a complete defense against Dialers. Scan all files on your harddisks for Dialer behavior using the Dialer scanner. The integrated background guard protects the PC from new infections. As soon as a potential Dialer creates. Scan the PC for Dialers and protect it with the Anti-Dialer background guard. Use the Emsisoft Anti-Dialer Scanner to scan your hard disk, remove all infections and restore your PC to maximum performance. Sometimes it is possible that the system may be unstable after removing a Dialer because it already manipulated too much. Therefore it is recommended to place detected Dialer always in Quarantine first before removing it permanently. Don't forget to run an online update before you scan your computer with Emsisoft Anti-Dialer. 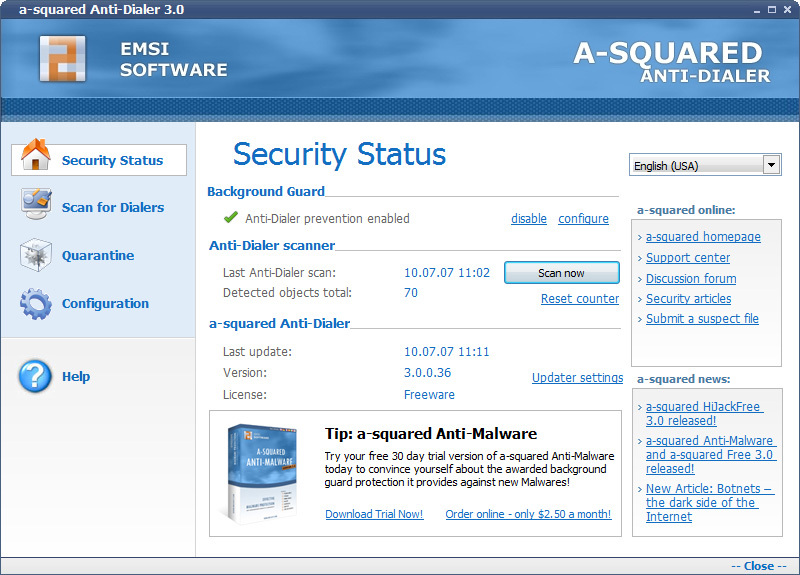 Note: The automatic update feature is only available in Emsisoft Anti-Malware. Regardless of whether you are a computer expert or a beginner, you will quickly become familiar with Emsisoft Anti-Dialer. You do not have to be a specialist to free yourself from Malware. Cause a phone bill of several hundred dollars. Qweas is providing links to Emsisoft Anti-Dialer 3.5.0.1 as a courtesy, and makes no representations regarding Emsisoft Anti-Dialer or any other applications or any information related thereto. Any questions, complaints or claims regarding this application Emsisoft Anti-Dialer 3.5.0.1 must be directed to the appropriate software vendor. You may click the publisher link of Emsisoft Anti-Dialer on the top of this page to get more details about the vendor.